Bushnell, the #1 laser rangefinder on worldwide professional tours and Bollé eyewear have joined forces with the PGA EuroPro Tour to initiate a new partnership which underlines the quality of products and their commitment, as leaders in golf performance optics, to improving the performance of golfers at the highest levels of the sport. As the first professional tour to allow the use of Distance Measuring Devices (DMD) during competition play, the partnership highlights the continued importance of Bushnell products for the game’s elite players. With 97% of players putting their trust in Bushnell products for tournament preparation on the PGA Tour and 90% on the European Tour, Bushnell devices are already an invaluable tool for the world’s best golfers. This is taken one step further by the PGA EuroPro Tour, who fully embraces the benefits of laser rangefinders, actively encouraging their use in tournament play. Andrew Grose, Managing Director of Bushnell UK, explained the natural synergy of the partnership: “We are extremely happy to be involved with such a forward-thinking tour that supports the development of aspiring young professionals looking to become the next Lee Westwood or Rickie Fowler. It is great that they acknowledge Bushnell rangefinders as a key part of the process. Over coming years, we hope to continue the trend of our products being utilised in tournaments, building upon the trust that we already see from amateurs across the game every week. “This deal coincides with the launch of our exciting new product, the Tour X. Available to golfers from April, this device features revolutionary technology that will provide golfers with one device that can be used both in practice and in tournament play, perfect for those competing on the PGA EuroPro Tour. The agreement begins from the first event of the season on 13th May and will see every winner being presented with the new Bushnell Tour X product and a pair of Bollé golf glasses. In return, Bushnell and Bollé will receive a host of branding opportunities, whilst presenting a number of product offers exclusively for PGA EuroPro members. Bollé, which has been providing performance sports optics for over 100 years, including eyewear specifically designed for golfers to improve clarity during play, will also be presenting a pair of their specialist Golf Sunglasses to all winners. With the likes of Lee Westwood already utilising the advanced technology present within Bollé sunglasses, this partnership will progress Bollé’s reputation as the leader in golf specific eyewear. 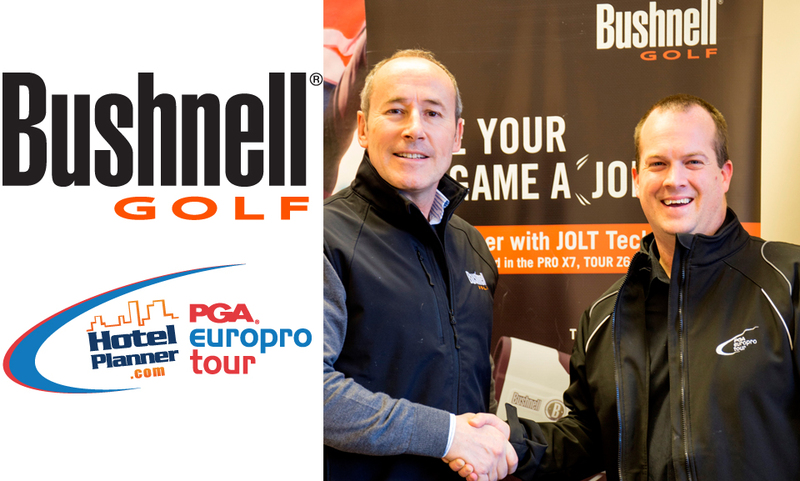 “I am delighted to welcome Bushnell as a partner of the PGA EuroPro Tour. They are the market-leader and a fantastic brand. I feel this is a partnership which will benefit both parties, as well as the many great young players who play on the EuroPro Tour. Commented Dan Godding, Director of Operations at the PGA EuroPro Tour.